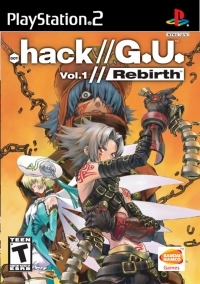 Box Text: Welcome to "The World..."
As Haseo, you must uncover the truth behind bizarre occurrences in the MMO "The World" that seem to be tied to events in reality. It is a dangerous journey, but you will not fight alone. Create parties, join guilds, and develop new skills to hack "The World" to your advantage. Utilize previous .hack game save data! All new storyline in a Simulated MMO! Advanced AI and Real-Time Fighting! 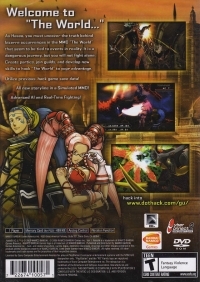 07-26-2015 egen Box Text Welcome to "The World..." As Haseo, you must uncover the truth behind bizarre occurrences in the MMO "The World" that seem to be tied to events in reality. It is a dangerous journey, but you will not fight alone. Create parties, join guilds, and develop new skills to hack "The World" to your advantage. Utilize previous .hack game save data! All new storyline in a Simulated MMO! Advanced AI and Real-Time Fighting! 03-22-2012 scott Box Text Welcome to "The World..." As Haseo, you must uncover the truth behind bizarre occurrences in the MMO "The World" that seem to be tied to events in reality. It is a dangerous journey, but you will not fight alone. Create parties, join guilds, and develop new skills to hack "The World" to your advantage. Utilize previous .hack game save data! All new storyline in a Simulated MMO! Advanced AI and Real-Time Fighting! 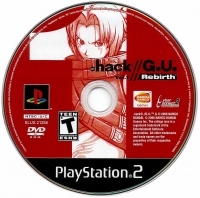 This is a list of VGCollect users who have .hack//G.U. Vol. 1//Rebirth in their Collection. This is a list of VGCollect users who have .hack//G.U. Vol. 1//Rebirth in their Sell List. This is a list of VGCollect users who have .hack//G.U. Vol. 1//Rebirth in their Wish List.